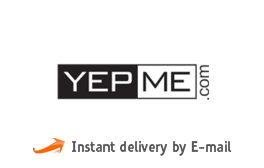 Yepme is the India's first online fashion brand for Apparel, Footwear & Accessories. Yepme.com is delighted to introduce yepme e-Gift Voucher. Yepme lets you confidently put up a bold and contemporary style statement amongst your peers. All yepme products are a result of best practices followed right from fabrics to fit and fashion. yepme products come to you after going through a series of quality checks for everything that you consider when you decide to take it on. Years of retailing expertise and a keen focus on creating not just apparels, but memorable experiences for you, dictate theirr work pattern. Every single stitch, color, the choice of fabric, everything has been designed and put together to give you that best brand feeling. 2. The E-Gift Voucher cannot be used to purchase other E-Gift Voucher. 3. Only 1 E-Gift Voucher can be redeemed against an order. 4. E-Gift Voucher can also be clubbed with other promotions available on the website at that time. 5. If the order value exceeds the E-Gift Voucher amount, the balance must be paid by the other payment modes.